The Carson Springs Wildlife Conservation Foundation is located in Gainesville, Florida. Visitors to the Conservation Foundation will learn how the organization is working to rescue endangered animals in need of help and how the center. as a rehabilitation center for local wildlife. The Carson Springs Wildlife Conservation Foundation was established by Christine and Jerry Banks. The couple donates their land and their time to working with the animals at the foundation. The Conservation Foundation is home to seventy animals of an exotic nature and more than twenty-five different species. The Foundation encompasses huge natural habitats with shrubs, grass, and trees. The Carson Springs Wildlife Conservation Foundation is licensed with Alachua County, Florida, the U.S. Fish and Wildlife, and the United States Department of Agriculture. The foundation goes through at least one inspection a year and has never been cited. It is a member of the Zoological Association of America and the Feline Conservation Federation. The Conservation Foundation is a not for profit organization that is funded completely by private donations and grants. All donations go straight to providing food, housing and care for the animals that call the Foundation home. The Carson Springs Wildlife Conservation Foundation serves mostly as an educational and conservation facility that saves exotic animals. It also carries a rehabilitation license for local wildlife. Endangered species are housed and supported at the facility. The Carson Springs Wildlife Conservation Foundation houses several species of animals, many of which are exotic or even endangered animals. Rio and Ruby the Red River Hogs- Rio came from Connecticut and Ruby from Virginia. The pair may have babies in the future. 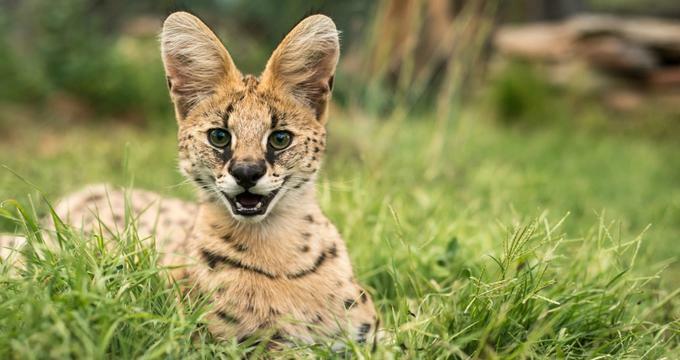 Ollie the Serval- Ollie was originally purchases as a pet, but soon became too big. He was rescued from a locked cage in a basement. Spirit, Cammie, and Richie the Cheetahs- Hopefully babies are in the future for these cheetahs. Bagy the Sucata Tortoise/African Tortoise- Bagy has grown up at the facility. When he was first obtained he was small enough to fit in the palm of the hand. Jericho and Jezebel the Striped Hyenas- The pair of Hyenas were given to the Foundation after their exhibit in the Virginia Zoo was closed. Since they were handled quite a bit, as young cubs they are friendly and love cuddling with their caregivers and each other. Xena and Isabel the Servals- Xena was taken from a roadside animal show by vet who saw how sick she was. She is now healthy and happy. Isabel was purchased as a pet and was rescued from the backyard of a house in Kentucky. Sunflower the Generic Tiger- Sunflower came to the Foundation when she retired as a photo cat. She was very sick and had to be nursed back to health. Shenzi, Eddie, and Scarlett the Spotted Hyenas- Shenzi and Eddie are Scarlett’s parents. Scarlett was hand raised and was taught a few commands by her caretakers. Henry the Indian Rhino- Henry is one of the Foundations famous animals. He has sired more than thirty baby rhinos throughout his life, though he is too old to father anymore. Dakota the Puma- Dakota was brought to the facility when she was just three months old as she was rejected by her mom. Sheena the Bobcat- Sheena was originally purchased as a pet by a Boston family. When she began to tear up furniture she was locked in the basement and then rescued and brought the Foundation. Samer and Lea the African Lions- These lions were mistreated and alone for years before they were rescued. As soon as they were introduced they connected and have been together since. The Foundation is hopeful they will reproduce even though they are a little older. Missy and Simon the White Ruffed Lemurs- These lemurs are endangered. Bandit and Nala the Bat-Eared Foxes- Bat eared foxes from South Africa are becoming endangered and in need of conservation. The Foundation is hopeful the two will breed in the near future. Siri the Amur Leopard- Siri was only a kitten when she arrived at the Foundation. Amur Leopards are the rarest big cats in the world. There are less than fifty of them in the world. The Carson Springs Conservation Foundation works to educate all visitors. All visitors are given information about the twenty-five-species housed at the facility. Visitors get to meet the animals and learn their stories. All tours emphasize important information on preservation and conservation and the way nature balances itself out. The Foundation works as a facility for continuing the education of student volunteers in all age ranges. In addition to taking on student volunteers, the facility provides special tours for camp, church, and school kid’s groups.